So, you moved your light off camera (very good) and looking for some new ways to explore more lighting options. 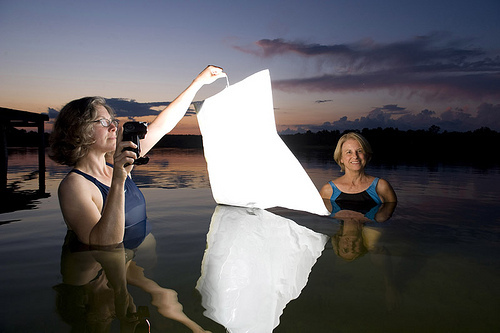 Some of the most interesting light can come from doing the unexpected with your flash. Here are five great techniques to boost your off camera lighting. 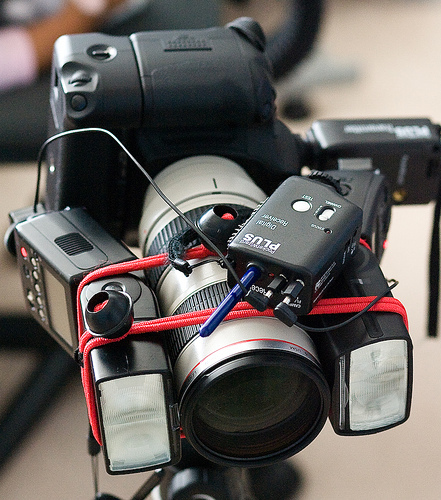 After exploring those five you’ll have a great toolbox for shooting pictures with off camera flash. Ring light is one of the lighting modifiers very commonly used in the fashion industry. The fact that light is coming from all around the lens provide a shadowless image on one hand and a great halo effect on the other. Packing two Canon speedlites and a pocket wizard this mod may not be suitable for the poor, yet if you have the lights around, you’ll get a semi-pro ring light for the price of two ball bungees. Some of the hardest things to light are specular objects. (Or simply put – shiny things). Watches; Cell phones; Sony PSPs, you know, shiny. The “secret” to light specular object is that you don’t pour light directly on the object, but on the surface that reflects off the object. The light from the reflected surface will bounce from the specular object to create nice and even light. 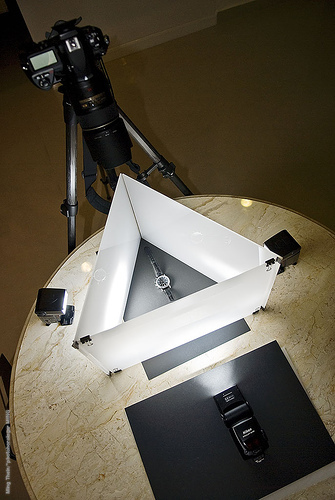 By using Plexiglass (or Perspex) you can create evenly lit surfaces to bounce light off from. (If you only need one bright surface, use this hack; If you want to learn more about specular objects and lighting in general check out Light Science and Magic – the best lighting book ever). Some objects are best lit from down under. Fluids in translucent containers are a great example of such objects. 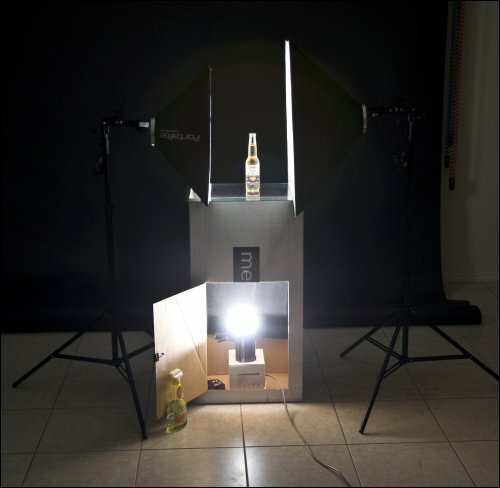 To create some great underlight, you can use an everyday cardboard box topped with a piece of glass. Hiding the flash in the box will help you eliminate flare. Is this a radioactive apple? Nope, it is an apple that had a core-removal surgery and a flash transplant follow up. Coring the apple makes it thinner so it is easier for light to go through the apple. 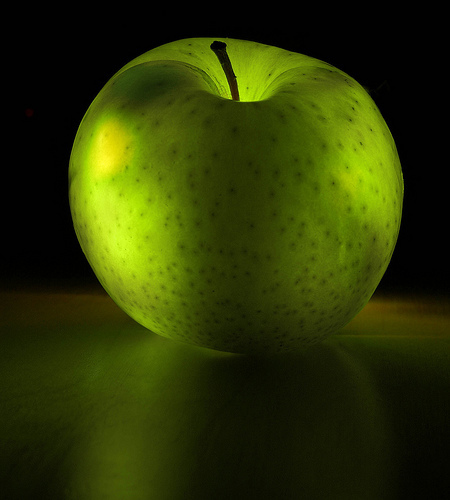 When the light from the strobes hits the apple and goes on the other side of it, it looks like the apple itself is the light source. For more details on this shot go here. It is a well known “secret” that people look their best under soft light. 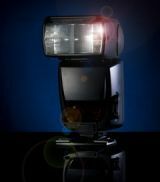 Unfortunately, both small strobes and big strobes produce hard light. (The smaller the light source, the harder the light). Fortunately, almost any semi-translucent material can be sued as a diffuser. Starting with garbage bag as was done in this picture, through sketching paper, baking paper, white t-shirts and more.